Many of us are still enjoying the last of the wildflowers in Texas. 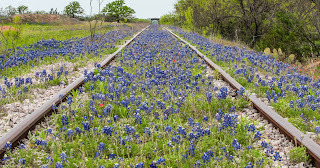 I thought I would post this one of the bluebonnets on the tracks before the season is gone. This is a beautiful place up near Marble Falls, Texas.